Our main entrance is on West Montgomery Avenue between Bouvier Street and 17th Street. By car: From I-76 or I–95, take 676 to the Broad Street exit. Follow Broad north to Norris Street (look for Temple University’s red banners). Turn left on Norris, go three blocks to 17th Street, make a left and follow 17th Street one block to Montgomery Avenue. On street parking is available on Montgomery Avenue, in front of the museum and nearby. Garage parking is available at Temple’s Liacouras Center; the garage entrance is on 15th Street, below Montgomery Avenue. By train: The closest SEPTA Regional Rail station is Temple University (a 15-minute walk from the Wagner). If you are coming from within the city, you can take the Broad Street subway (Orange Line - LOCAL only) to Temple University/Cecil B. Moore Avenue. 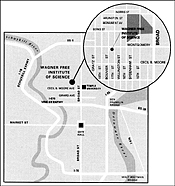 Walk one block north to Montgomery Avenue, three blocks west to 17th Street.